"So Merlyn sent you to me," said the badger, "to finish your education. Well, I can only teach you two things -- to dig, and love your home. These are the true end of philosophy." Swarms -- 16 May 2014 -- So the bees came through winter with many combs of honey in reserve. I didn't harvest any of it because I wanted to make sure they would be ready to swarm this year so that I could do a split and have two hives. I figured it would take them a few months to build up their population enough to swarm, and some time in early May I would do an inspection and look for queen cells. If I found them, I would find the queen, move the queen and about half the combs into the #2 hive, keep all the combs with queen cells in the #1 hive, and also put some branches around the entrances to the #2 hive so the bees would re-orient and not go back to the #1 hive. So the bees feel like they've swarmed without actually swarming. In late April, they swarmed. It started with lots of bees flying fast in a small radius around the hive. The radius increased to half the back yard. It was fun to stand out there knowing that swarming bees are not aggressive. Then they began to cluster on a branch about 20 feet up a neighbor's spruce tree, just over the property line. I didn't take a photo because you can do an image search for bee swarm and it looked just like that. By chance, someone was storing a long ladder at my house, so I stretched it out, leaned it on the fence, and climbed up wearing my jacket and veil and gloves and carrying a five gallon bucket. I could just barely touch the branch without falling off the ladder, so the best I could do was give it a shake, catch most of the bees in the bucket, carry them to the #2 hive, dump them in, and replace the bars on top. Within an hour, they were back on the branch. I did it again, and again they went back to the branch. Apparently I was failing to get the queen off the branch, but I couldn't reach it well enough to do more than shake it. So I said whatever, let the bees do what they want. I already had both of my bait hives out and some scout bees were checking them out. I figured they would have to make a decision before nightfall, but they stayed up on the branch all night and were still there in the morning. I went to the food co-op and when I came back they were gone. Sometimes a swarm will go back to the home hive, and it still looked pretty crowded in there. But I think, because of later evidence, that they flew away and found a home they liked better than my empty hives. I did an inspection, expecting to find a bunch of queen cells, and found only one. It happened to be on the one comb that broke off, so I balanced it back in there in case that was their only source of a new queen. Less than a week later, they swarmed again! This time they were on a branch right over the fence, only five feet up, and they were easy to catch. I waited for them to settle, shook and brushed them into the bucket, covered it, and dumped them in the #2 hive. Gradually they worked their way to the outside of the hive and clustered there. I spotted the queen, and she was not the original queen from last spring, who was darker and had a paint marking from the queen factory. This means the original queen probably went away in the first swarm. Again, they stayed all night clustered on the outside of the hive. Early in the morning before they started flying, I brushed them into a bucket, dumped them in the #2 hive, plugged up all the holes but one, and sat for an hour watching that hole. I had to make sure the queen didn't come out, and that the bees still outside the hive went in. If they didn't go in, that meant the queen wasn't in there, but they did. Eventually the bees going in and coming out reached equlilibrium, and I plugged up all the holes to keep them in there. Then I cut two little squares of eighth inch hardware cloth and thumbtacked them over two of the holes so they had ventilation. Late that afternoon I opened the holes and they stayed inside, but they were still clustered up in one corner, instead of hanging straight off the bars and building comb like the original package bees in the #1 hive. So the next day I opened the #1 hive, removed two bars of mixed brood and honey and some bees, and stuck them into the #2 hive. This created space in the #1 hive which should keep them from swarming again, and made the #2 hive feel more like home to the new bees, who soon moved over to cover the combs. I also fed them some honey. A day or two later, the #1 hive swarmed again! They settled on a low branch, and I made a post on the local permaculture group to see if anyone wanted them. (I've decided to stay below the radar of the local beekeeping groups in case some of them are militantly in favor of treatments.) Nobody bit, again they stayed the night outside, and late the next morning they were gone. Did they go back to the original hive? Now my memory is vague, because there was a fourth swarm, up high in the spruce tree again, and there was another day when we were gone and might have missed seeing a fifth swarm, and somewhere in there, a swarm occupied one of my bait hives, not the one in the tree in the front yard but the one under the garage awning, which you can see in the photo above. I opened the #1 hive again and gave them much more space and cleaned out a bunch of crazy honeycomb. 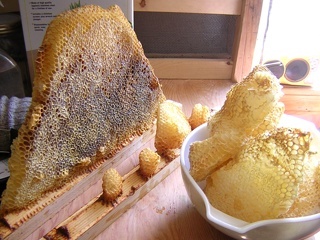 In the photo you can see an ideal honeycomb on the left, and a bar with some erratic bulging combs that will lead to cross-combing, and a bowl full of comb that was not even connected to bars but I had to dig it out of the back of the hive. If bees are making brood comb, they will make cells no deeper than the length of a bee. 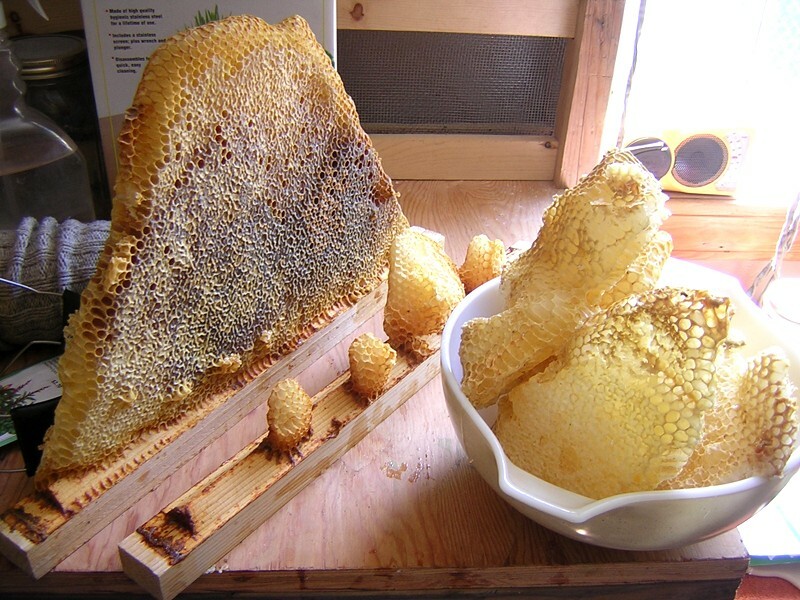 But if they plan to use it only for honey, they might make the cells much deeper and the combs much thicker. I pressed all this and got another quart, plus I kept a couple inches of good comb on the bar in case I want to stick it back in a hive later for feeding. Now I have three hives: the original, the second, which is looking weak, and the bait hive, which is looking strong. 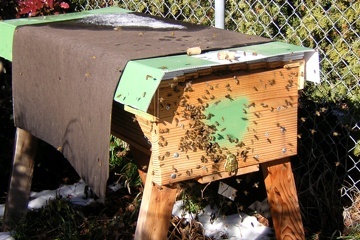 The colony in the bait hive has to be moved into the #2 hive before winter, and it's better to move them sooner before they build the combs too big to fit in there, but I want to wait until they've built enough combs to hold all the bees, because they'll be easier to move. There's also the problem of keeping the two colonies from fighting too much, while still having separate entrances. I have a plan. Thaw -- 13 February 2014 -- The last time I opened the hive was early August, half a year ago. That gave the bees plenty of time to gather more stuff, arrange it all for winter, and seal up the hive. In October they still had not kicked the drones out, but they're definitely gone now. I peek in the window about once a week, and I was expecting to see a large population eat their way front to back through the honeycombs, but instead I've watched a declining population stay at the front of the hive. Last week we had an unseasonal deep freeze, and after a night when it got down to -3F (-19C), the bees were clustered so tightly to the ceiling that I was afraid the colony was dying. In the photo you can see that they're fine. 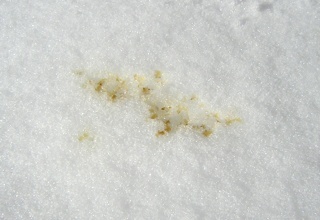 Two days ago, on the first warmish sunny day, there were a few dozen bees flying around and pooping in the snow, and yesterday they all came out. You can also see that they like the front entrances better than the top entrances that the hive was designed for. 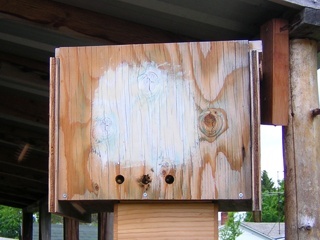 I've drilled a total of five holes on the front, and through most of winter I had three of them sealed with wine corks. 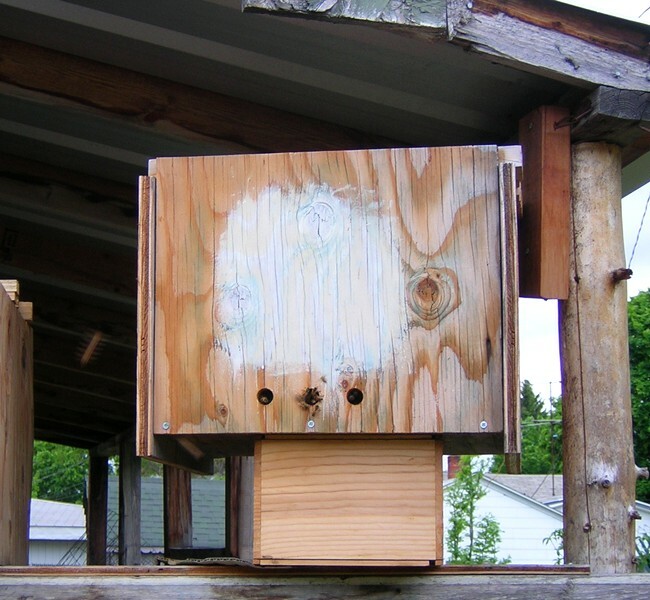 On the coldest nights I closed them down to one hole -- you never want to completely close it because they need ventilation to get the moisture out. That black thing is tar paper to help them keep warm, but I've removed it now, and as the weather warms I'll keep more entrances open full time. 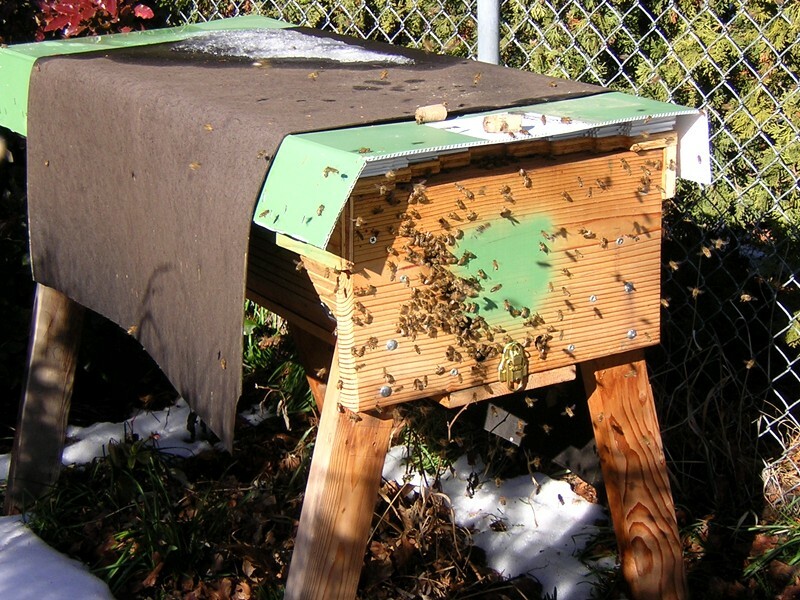 They still have massive honey stores, and should regrow their population with no supplemental feeding and be ready for the first flowers in a month.